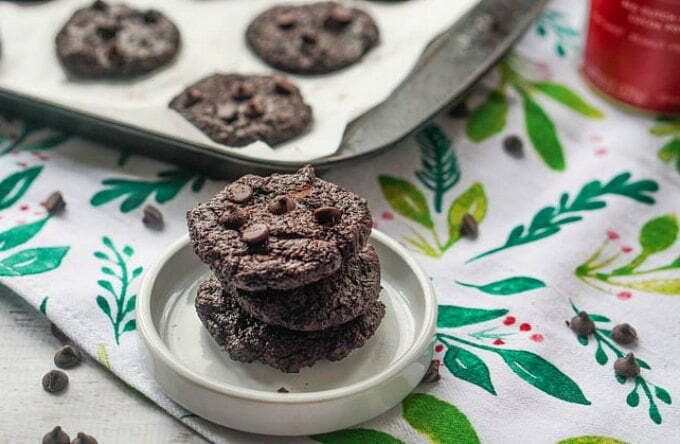 Low Carb Chocolate Brownie Cookies - For Sweet Keto Snacks! 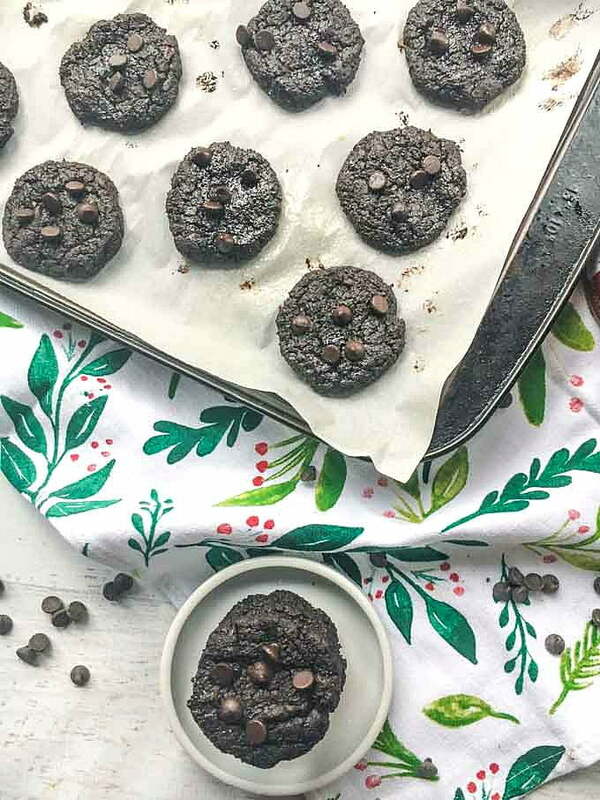 Low Carb Chocolate Brownie Cookies – For Sweet Keto Snacks! 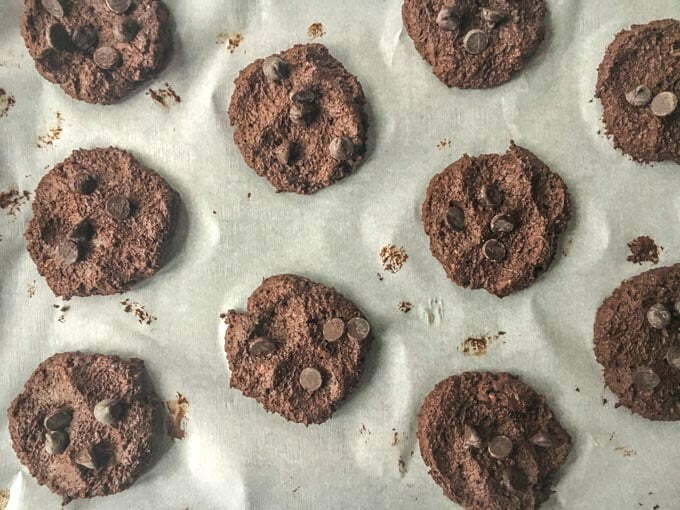 These low carb chocolate brownie cookies are so easy to make and will definitely satisfy your chocolate cravings. 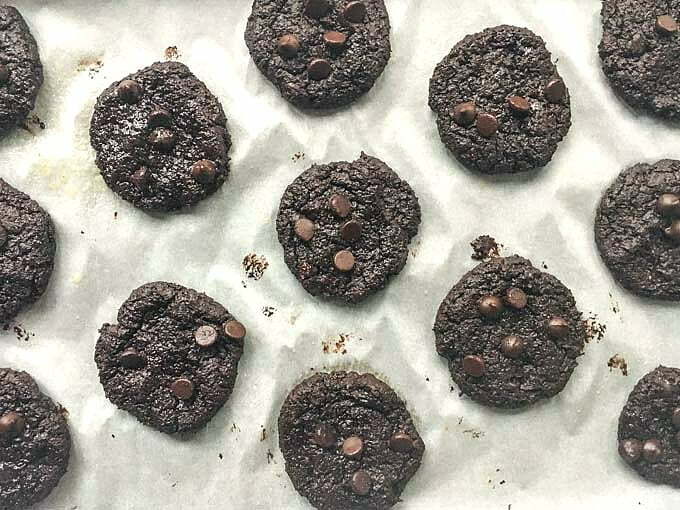 For sweet keto snacks, these Soft and chewy, keto cookies are very chocolatey and only require a few ingredients. Only 1.2g net carbs per cookie! You might really like these keto chocolate peanut butter cookies too! One thing I miss on a low carb diet is cookies. I love cookies! And while I have a few low carb cookie recipes, sometimes I don’t want to use almond flour. Too many nuts can give me a headache. So when I came across a few recipes on Pinterest for cream cheese cookies I thought I’d give it a try. I am SO psyched about this keto snack recipe. 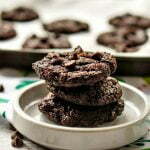 These low carb chocolate brownie cookies are REALLY good to me! They are not too pretty but they are tasty and I have already made 2 batches. Some of the easiest are just simple foods like eggs, avocados, cheese or meats. However I like to snack on veggies and lots of dip. Use low carb vegetables (see chart in this post) and high fat dips. For sweet keto snacks try berries such as strawberry, raspberries or blackberries with heavy whipping cream. I like very dark chocolate or these cookies! Here’s a great visual guide from the Diet Doctor. 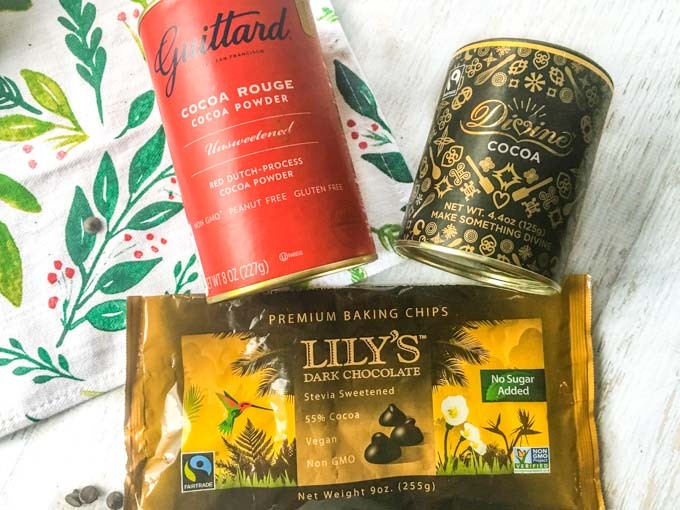 First off I want to tell you about two important ingredients that make this recipe: good cocoa powder and Lily’s stevia sweetened mini chocolate chips. You can find them here on my Amazon store. I am now hooked on these two brands of cocoa powder. Both Guittard and Divine brands are very smooth and rich with roughly 1 net carb per 2 tablespoons. The cocoa powder I get at Aldi on the other hand has 4g net carbs per 2 tablespoons and it taste more bitter to me. I bought both of these from Amazon and have been making my own hot chocolate with them (recipe coming soon). Above you can see the Lily’s chocolate chips I used. They are good and have no artificial taste to me. However they are not overly sweet. For roughly 3 tablespoons (120 mini chips) they only have 4g net carbs. I sometimes eat these as a snack too. Their sweetness comes mainly from erythritol and stevia. Above you can see what they look like going in the oven and below what they look like coming out. They don’t spread or rise much. So you want to use a mixer for this one. Put in your cream cheese that has been softened and creamy it with the Swerve sweetener. Then add the cocoa powder, baking powder and egg. beat until well mixed. Add in half of the chips and mix by hand. Then line a cookie sheet with parchment paper. The dough is very sticky so form the batter into little balls and then flatten with your fingers. Use the remaining chips to place on top of each cookie. Bake for 10n – 12 minutes and they should be firm to the touch. I seriously love these low carb cookies! For sweet keto snacks, they are the best for me. I store them in the refrigerator and eat one or two for dessert. They are very chocolatey and filling. As for the texture they are more like if a brownie and a cookie had a baby. They are not crunchy at all which is fine with me. 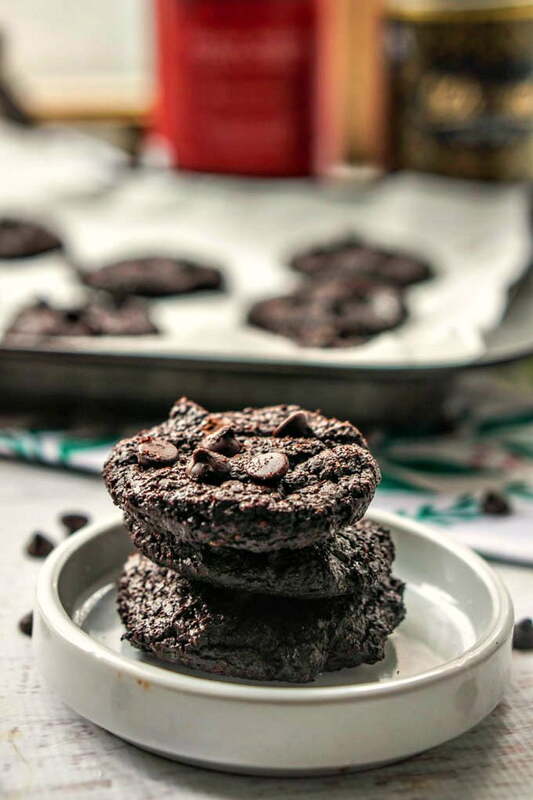 These low carb chocolate brownie cookies are so easy to make and will definitely satisfy your chocolate cravings. 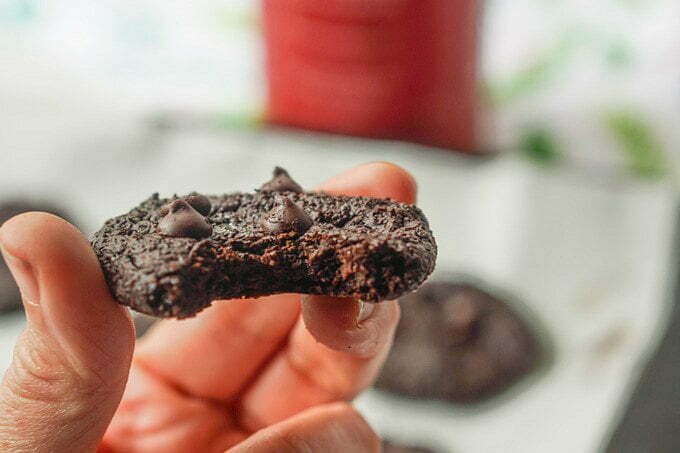 Soft and chewy, these very chocolatey keto cookies only require a few ingredients and have 1.2g net carbs per cookie! Using a hand mixer, cream the Swerve sweetener and cream cheese. When nice and creamy add in the baking powder, cocoa powder and egg. Mix well until a dough forms. Add in half of the chocolate chips and mix with a spoon to incorporate. Spoon out the cookies on the cookie sheet. The dough is very sticky. Flatten the cookie dough with your fingers and sprinkle a few of the remaining chocolate chips. This batch made 15 cookies for me. Bake for 10-15 minutes. You want the cookies to be firm to the touch but not too firm. Take out of the oven and let cool completely before eating. Eat immediately or store in the refrigerator. *Note* I used Guittard or Divine cocoa rough powder. It's a better brand of cocoa powder and has less carbs. You can use regular cocoa powder but it might increase the carbs. For the chocolate chips I used Lily's dark chocolate stevia sweetened mini chips. 120 chips is roughly 3 tablespoons and only 4g net carbs.